Beautiful You: What's In My Skincare Corner | Updated Skincare Routine! What's In My Skincare Corner | Updated Skincare Routine! As my 'What's In My Shower Tag' went down SO well I thought that I would keep it on the same track and show you what is in my skincare corner! I am at university and my room is small therefore I cannot afford to keep loads of skin care so I only have what I currently use. I will show you what I am using now and give you my honest opinion on them! My night time skin care is better than my morning routine as I just have more time in the evening, so I shall start there! I firstly take out my contact lenses and then move on to removing my make-up. 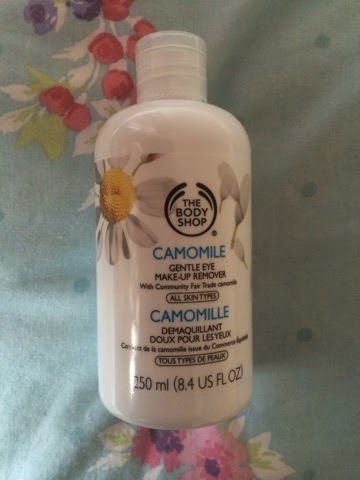 To do this I use Body Shop's Camomile Gentle Eye Make-Up Remover for my eyes, this is really good for people with sensitive eyes like me because although it is gentle it still removes most of your eye make up! 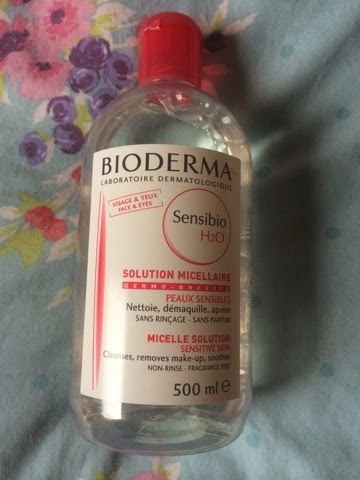 I then remove my face make-up using, no surprises here, Bioderma! This is the most amazing product and I have loved it for a long time, not only does it remove so much make-up from your face it also leaves your skin feeling hydrated which I really love. I haven't tried any other new products like this but I have bought the Garnier one to try out! 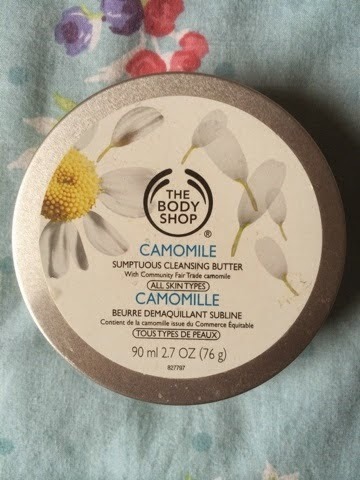 Once I have removed most of my make-up I will use my Body Shop Camomile Cleansing Butter to cleanse my face and to make sure that all make-up has been removed. I was bought this for Christmas because I wanted to try out Emma Hardie's Cleansing Balm but I didn't just want to jump in a the deep end, however I have been loving this wiped off with a hot face cloth so who knows I may try Emma Hardie's soon! 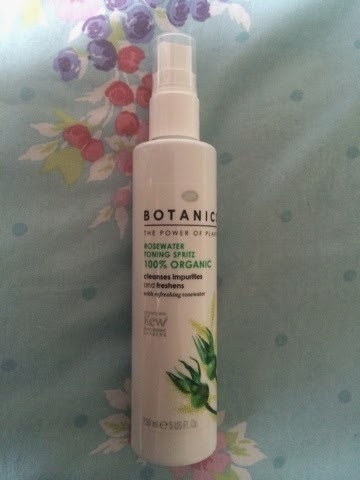 I then have a shower, and you can see what I use for my shower routine here, once that is complete I make sure that my skin is completley clean with Botanics Rosewater Spritz. I spray this on to a cotton pad and wipe all over my face, it gives my skin an extra boost before I apply my moisturiser/night cream! 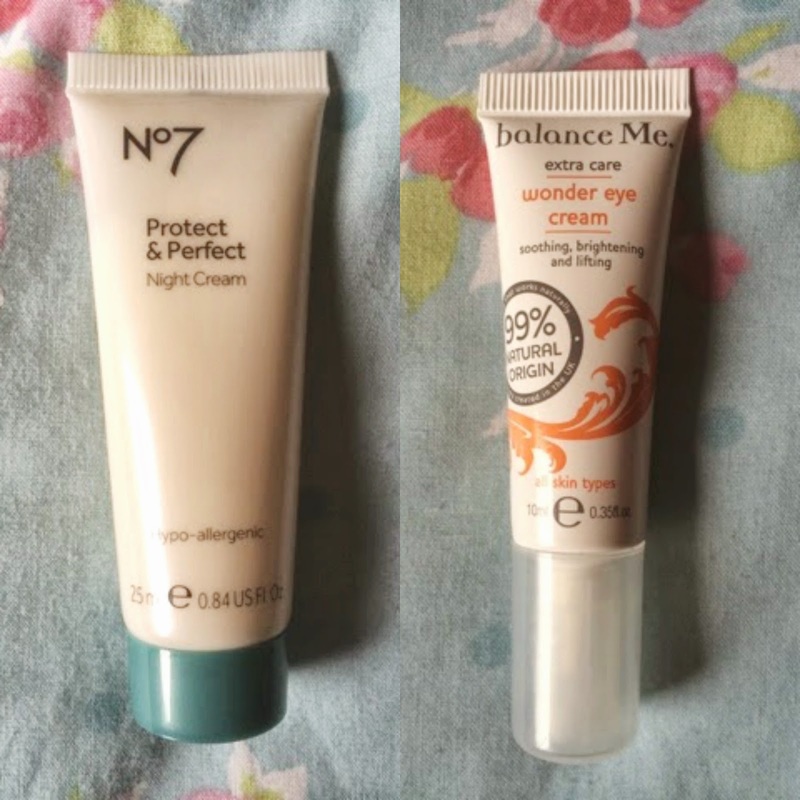 The current night cream that I am using is No7 Protect and Perfect night cream, I was given a sample of this to try and so far I have been loving it! It is really think and creamy which makes me think that it gradually sinks in over night and in the morning my skin does feel very hydrated. I then use my eye cream, which hasn't changed since the last post, I am still using Balance Me's Wonder Eye Cream because I love it! 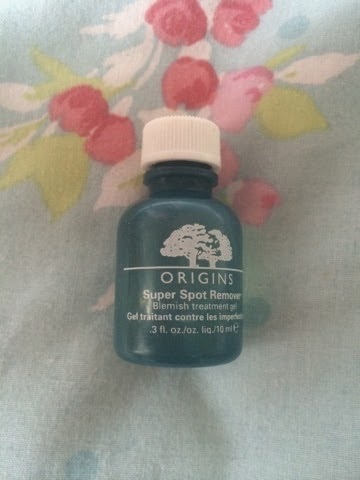 Lastly, if I have any spots that day I will apply Origin's Super Spot Remover directly to the area to help reduce the redness and inflammation. If you follow me on twitter or know me personally you will know how much I love this product, its my holy grail product! My morning skin care is so simple and I probably should do more but all I do is use the Rosewater Spritz again in the same way to make sure my skin is clean and to remove any of the residue leftover from the spot gel. I then use No7 Beautiful Skin Day Cream to moisturise before applying my makeup, this sinks in so quickly which I love! I hope you have enjoyed seeing what skin care I use and maybe it has given you some inspiration for some new products to try out! My skin care routine doesn't really change that often and this has been the same since Christmas so I can really give an honest opinion that these prodcucts work and I would recomend them all! As usual, I shall leave the links to my two giveaways here so you can enter, it is a chance to win free stuff, who wouldn't want to enter! MAC giveaway here and Twitter giveaway here, this one ends on Friday the 28th of March at 12pm so get your entries in quick!! I will announce the winner on Twitter sometime in the evening, I wish you all the best of luck! Let me know if there is any particular skin care product you have been loving recently or if you have tried/loved any of these or if I should try anything in particular, I love hearing your opinions. I hope you are all having a good week and I shall see you all on Friday! I have sensitive skin so I've been wanting to try a few things from the chamomile line! So glad to hear that you like them! 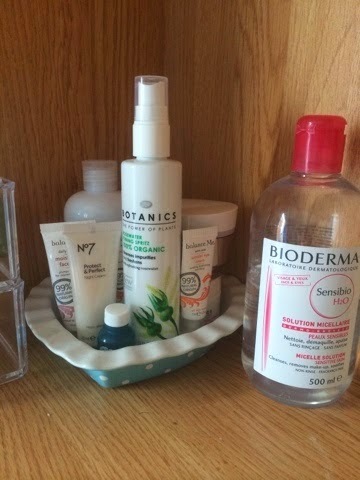 Love seeing what skincare people use - I'm a fellow bioderma lover!